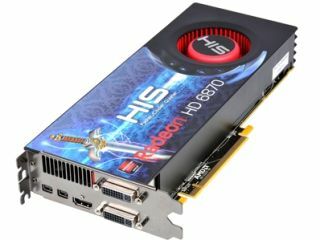 HIS has announced its latest HD6850 and HD6870 graphics cards, bringing HD3D, EyeFinity, EyeDefinition and EyeSpeed technology. Hightech Information System's latest offering uses the newly announced AMD HD 6850 and 6870 graphics solution. "Hightech Information System Limited is proud to unveil the new HIS RadeonTM HD 6850 & 6870 graphics cards," said the HIS release. "Equipped with HD3D stereoscopic technology and three powerful features - EyeFinity, EyeDefinition and EyeSpeed, the new HIS RadeonTM cards offer an incredible application performance experience and flawless high-resolution imagery for an enhanced gaming experience." The cards bring HD3D technology – although you will need a pair of HD3D glasses to benefit from two separate beyond-1080p pictures. The cards are available now for £149.99 for the Radeon HD 6850 and £199.99 for the Radeon HD 6870.